Is a proper vector? Suppose that and . Clearly, . However, if we rotate the basis through about the -axis then , , and . Thus, does not transform like a vector, because its magnitude depends on the choice of axes. So, above definition is a bad one. 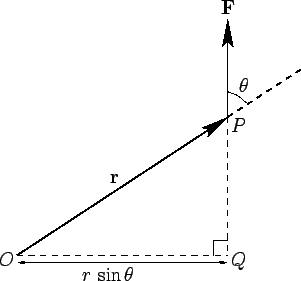 Therefore, is perpendicular to . Likewise, it can be demonstrated that is perpendicular to . 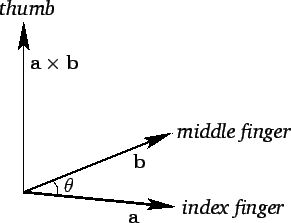 The vectors , , and form a right-handed set, like the unit vectors , , and . In fact, . This defines a unique direction for , which is obtained from a right-hand rule--see Fig. 6. Figure 6: The right-hand rule for cross products.